This is the fourth in a series of updates from CigarCzars.com about still being able to enjoy a fine cigar while on a cruise vacation. These updates supplement several previous (but now dated) articles that were originally published on About.com. Yes, I still really enjoy smoking cigars while cruising. 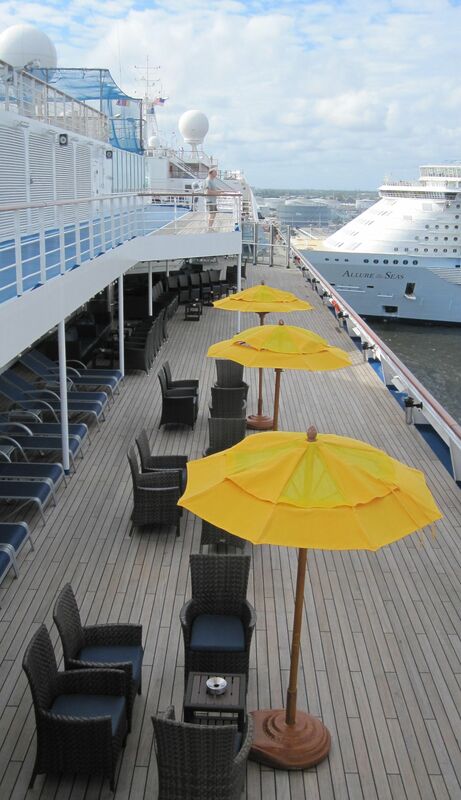 Unfortunately, the latest cruise ship policies just keep getting worse for cigar smokers. Based on my December 2015 and May 2016 cruises on the Carnival Conquest, I am disappointed to report that the only place on the ship to enjoy a cigar was at a designated outside smoking area on Deck 10. The Conquest is an older boat that was originally designed with an elaborate indoor cigar bar named Alfred's. As Carnival's smoking policies gradually became more restrictive, Alfred's was closed to cigar smokers, who were then banished to a smaller bar named Vincent's, near the back of the ship. This policy was also applied to other Carnival ships in the Conquest class (the names of the bars are unique to each ship). But now, cigar smoking is no longer permitted anywhere inside these Carnival ships, including small clubs like Vincent's, which are now off limits to cigar smokers. In my previous update on the Carnival Breeze, which is a newer ship that is not in the Conquest class, smoking was also limited to one designated outside area. However, that area is located adjacent to an indoor bar which happened to have stocked humidors. The outdoor smoking lanai on the Breeze was not only more convenient, but the covered area which protects smokers from the elements was much larger than on the Conquest. If you plan to cruise on the Conquest, bring your own cigars, and do not be disappointed if the weather prevents you from enjoying your cigars outside. If you forget to bring your own cigars, you can always buy them at the ports of call, and some ships still sell them by the pack or box in their gift shop. As I have written many times in the past, always check a ship's smoking policy for cigars before booking your next cruise. When booking a cruise well in advance, it is also important to realize that a ship's smoking policy could change before the ship actually sets sail. Always double check before making your final deposit. In conclusion, there is now only one final step still remaining to restrict cigar smoking any further on Carnival cruise ships, and that's to ban it completely. No cigar smoking in cigar bars, no smoking in cabins nor balconies, no cigar smoking anywhere inside the ship, and now no smoking on open decks except for one designated area on just one deck. Enjoy it while you can, because the next shoe that drops on cigar smokers will be the last.